Please note that the content of this book primarily consists of articles available from Wikipedia or other free sources online. 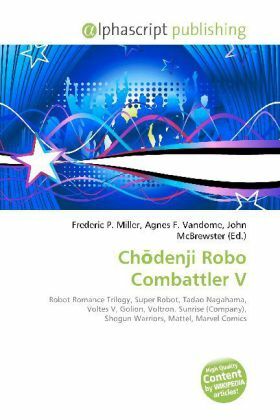 Ch denji Robo Combattler V is the first part of the Robot Romance Trilogy of Super Robot series created by "Saburo Yatsude" and directed by Tadao Nagahama. The robot''s name is a portmanteau of Combine, Combat and Battle, and the V is intended both as an abbreviation for "victory" and in reference to the five component machines that form the robot, as well as its five pilots. The V is pronounced as the letter V, whereas in the follow-up series, Voltes V, it is prounounced "5". The series (along with the later two shows) was created by Saburo Yatsude, who would later go on to create Golion (best familiar to American viewers as the "Lion Force" half of Voltron). "Saburo Yatsude" is not a real person, but a pseudonym which refers to the collective staff at Toei (the main office, rather than the animation studio; the series was animated by Nippon Sunrise and produced by Toei Co. Ltd).